In a previous post I mentioned that winters here in Oregon are Grey and Wet. The good thing though, is we start getting signs of Spring in January. Already trees are unfurling their tiny bright leaves and delicate blossoms and the bulbs that poked through the soggy ground last month are displaying their silky petals. Having moved to this home last summer I had no idea if there were any bulbs planted so Im delighted to find crocus in purple, white, and yellow, cheery daffodils, and tiny Dutch iris, as well as some kinds that I don't know. The days seem to go back and forth between brilliant sunshine and pouring rain. A few days ago it was sunny and in the 60s. We were out with no jackets and scrambling to find sunglasses. Today it snowed, beautiful, big flakes that fell gently to the ground. Mmmmmm, delicious! Snow reminds me of my childhood. It has a certain smell and a sound like nothing else. A quietness that I don't suppose is really a sound at all but it's the best way I can describe it. Of course there's also howling wild snow but we never get visited by that kind here. Peregrine went out and ran around in the falling snow, exclaiming that it must be Christmas! It turned to rain all too soon, but it was enough to make me feel excited and like a child again. It stuck for a while and I had to go take a picture of my crocus. That was always the first thing I remember coming up in Alberta, right through the snow, a sure sign that the long winter would soon give way to spring. Today is also Valentine's Day and my wonderful husband bought me a Mexican Truffle and left it in the fridge for me to find. Then, as if that weren't enough, he had roses delivered! I've been smiling like a schoolgirl all day. I'm the luckiest girl in the world, not because I got roses and chocolate, but because I got him! Four years ago on this day we got the best gift ever. It was the day we found out that I was pregnant with Peregrine, and I can't think of a better gift that we could have given one another than that. 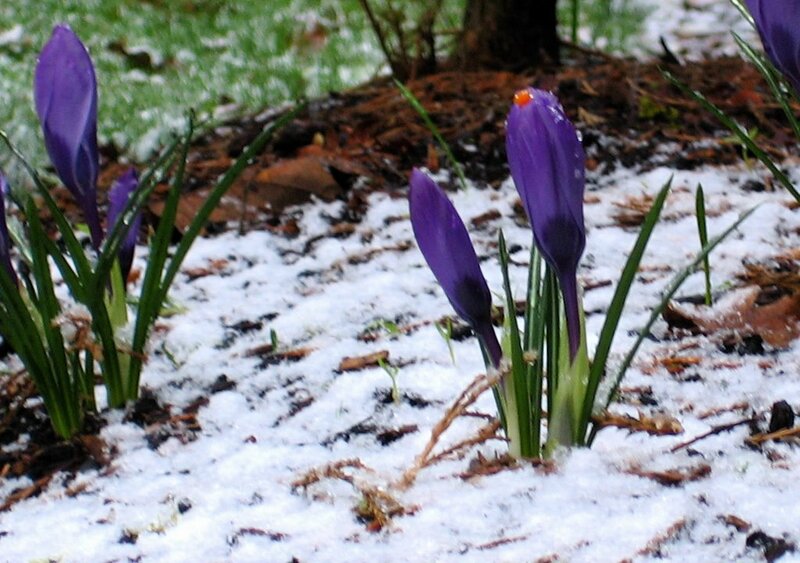 I am blessed, by snow in the springtime and brave little flowers who dare to open in defiance of the gray. I am blessed to have wonderful happy memories of growing up in a loving family. I'm blessed by my thoughtful and amazing husband who treats me like a queen even when I act like a spoiled brat. I'm blessed by my little Valentine boy, who's getting big way too fast, and by my spring baby, beautiful Poppy. And in all of these thing I am blessed by God, the Creator, who loves me and continues to pour out His gifts of love on us all. Your picture looks great, i think you have 2 photographers in the family. i stole ti for my desktop background. It was a magical morning.